MMF industries provide two systems of key control. The basic or single system provides individual hooks and numbered tags on which all keys can be hung. For ultimate protection, it is strongly recommended the dual tag of multiple identification system with the Permanent Loan Register for the maximum and most reliable security. 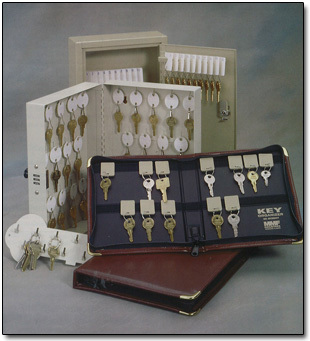 Horizontal, vertical and specialty key cabinets are available including emergency key boxes and security cash boxes. A variety of coloured and numbered key tags complement the key control systems. Copyright © 2003 Stegweit & Company Inc.